A cardioid that thinks it's an omni. 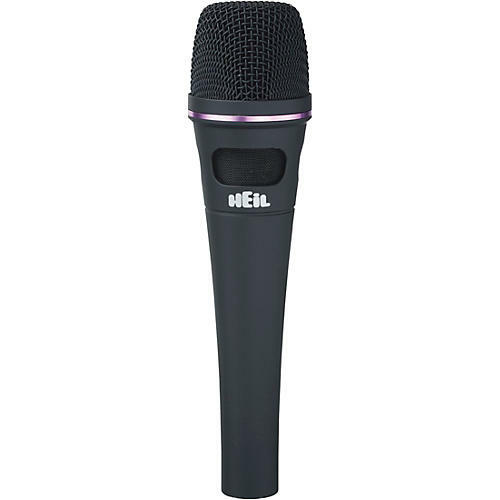 The Heil Sound PR 35 is an incredibly versatile vocal mic. It has an amazing amount of rear rejection but exhibits no off-axis coloration, so it is like having a supercardioid and omni mic in one! It works well for commercial broadcast, recording, and live sound reinforcement applications. When you need a smooth, flat response over a wide frequency range the Heil PR 35 is your mic. The PR 35 was designed around the acclaimed PR 30 element and incorporates a sorbothane shock mount to give you the best possible results. The PR 35 mic achieves its exceptional performance by using a special magnet structure and a large aluminum 1-1/2" low-mass voice coil assembly. A carefully wound and placed hum bucking coil allows the Heil PR 35 to be placed near video monitors without unwanted hum or buzz. Special attention has been paid to the phasing plug assembly with equally placed ports that sense audio from behind the source. It then enters them out of phase, thus producing a very linear cardioid pattern. This reduces the proximity effect while achieving the extreme articulation across its smooth 40 Hz - 18 kHz frequency response. The Heil element can be used in extreme high sound pressure levels and is immune to overload conditions. It produces a beautifully smooth audio response without the inconvenience of phantom or outside DC powering. The PR 35 microphone is equipped with a low-cut roll-off switch to prevent low-end feedback loops from ever getting started. The Heil PR 35 mic's cardioid pattern offers the greatest rejection of unwanted audio at 180 off axis, which is directly behind the microphone; there is virtually no off-axis coloration. Supplied with a microphone clip that mounts to any 5/8" 27-thread mic stand. It also comes with a leatherette carrying case and wind screen. For amateur radio, a CC-1 XLR cable is required to interface with a transceiver.